For the past few years, the use of remote-controlled drones is branching out in an increasing number of applications beyond the military, ranging from film and photography to agriculture, high-stakes drone racing and even as programmable matter. 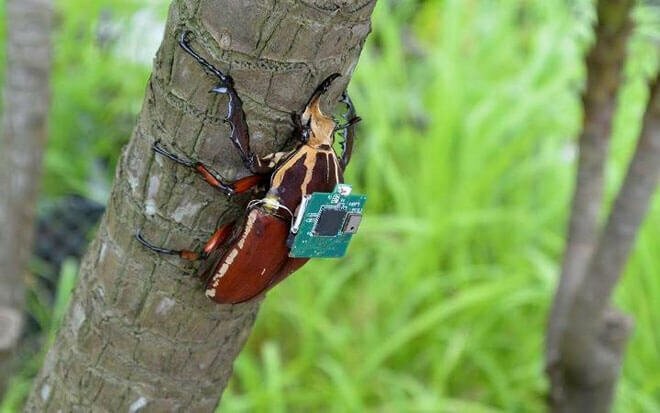 But microchip-enhanced live beetles — controlled by humans from afar — may soon join the ranks of these already familiar mechanical drones. 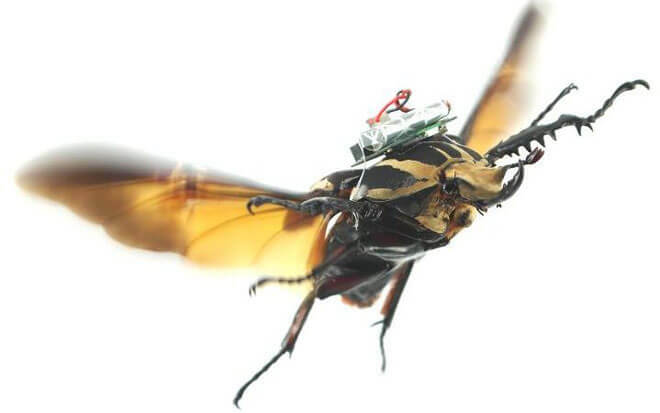 Scientists at Singapore’s Nanyang Technological University (NTU) and the University of California (UC) Berkeley created an insect-robot hybrid by inserting tiny electrodes into the legs, optic lobes and flight muscles of the Mecynorrhina torquata, or giant flower beetle. Using a non-toxic beeswax as a glue of sorts, a 1-centimeter square microprocessor is attached to its back, accompanied by a built-in wireless receiver and a 3.9-volt micro-lithium battery. Radio signals are sent through to this these electrodes to control the beetle’s walking gait, speed, and ability to launch, land and hover in the air, effectively regulating movements in different parts of the body. Different walking gaits were performed by reordering the applied stimulation signals. The research team studied the modified beetles’ mobility in a closed room set up with eight 3-D motion cameras to capture kinetic data. By varying the duration of the stimulation sequences, they controlled the step frequency, and hence the beetle’s walking speed. Measuring three inches long and weighing only eight grams, the relatively lightweight giant flower beetle is the perfect candidate for the job; it is disproportionately strong for its small size, capable of carrying extras like microphones and thermal sensors. Because no extra engineering is required to keep these beetle “biobots” in the air, they are more agile than their mechanical counterparts, and even would require less human intervention. “Unlike manmade legged robots — for which many tiny parts, sensors and actuators are manufactured, assembled and integrated — the insect-computer hybrid robots directly use living insects as nature’s ready-made robot platforms,” explain the researchers in their paper, published in Current Biology. Put together, these qualities make these tiny insect cyborgs much easier to maneuver than drones, making them invaluable in emergencies or disaster situations, as well as for surveillance. Since mostly off-the-shelf components are used, the system is also relatively cheap to produce, costing only USD $7 per unit, making these biobots a cost-effective alternative. Moreover, the scientists discovered that modified beetles had no problem living to their full lifespan of five to six months, even after their microchip backpacks and electrodes are removed. The study was facilitated by the team’s new insights into the function the coleopteran muscle, located between the insect’s wings. Besides this discovery helping the team to improve further the precision of the beetles’ turning motions, with the additional recent developments in power transfers over wireless systems, the team foresees that one day the system may be built to be battery-free. “In the future, the overall rig may not even use batteries. It could be powered from sustainable sources such as energy scavenged from ambient radio waves,” explained Sato. 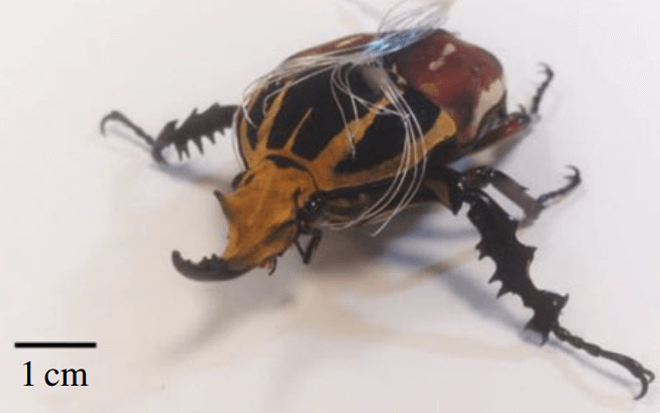 Remote-controlled animals are nothing new, and the science-fiction-worthy idea of a cyborg beetle becoming reality is pretty neat. But the achievement does raise some ethical questions, not to mention the possibility of misuse by whoever has access to the technology. After all, who wants giant beetles spying on them? Images: Nanyang Technological University and the University of California Berkeley.